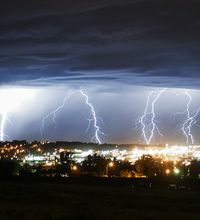 MORGAN – A lightning strike Sunday has claimed a second victim. Christopher Wold, 31, of Morgan succumbed to injuries sustained when he was struck while helping another man build a children's tree house, said Al Klimek, medical examiner for Oconto, Brown and Door counties. He had been hospitalized since the incident. The other man, 27-year-old Brad Cox of Abrams, died Sunday after the same strike. Klimek said the men were working in a white pine tree in the Oconto County town of Morgan about 6 p.m. Sunday. Wold's girlfriend heard the strike, went outside and found him on the ground, seriously injured. Wold was an organ donor, Klimek said Wednesday. Details of funeral arrangements were not immediately available. An Oconto County man is dead after a lightning strike in the Abrams area on the evening of Aug. 3. Authorities say two men were working on a tree house in the Town of Morgan when they were both struck shortly after 6 P.M.
A woman heard the lightning strike and looked outside, and found her 31-year-old boyfriend on the ground.